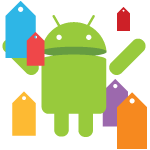 It looks like Google has surreptitiously started a little summer promo in the Play Store with discounts on apps and games, with some going below the usual $0.99 barrier. There's no official landing page yet, so we don't know everything that's included, but more could still be on the way. These are only the titles that are listing a connection to the summer sale. There are other (presumably unrelated) sales going on that we'll get to later. This post will be updated with any more summer promos we spot.